Managers are the first to take the blame when things go wrong, and I think it's only fair that Tony Mowbray (or is it Mobury?) gets a big slice of the credit for taking us back up. On paper we were favourites for promotion, but I think it's a lot harder to actually generate momentum when the club has been stuck in the doldrums for so long. Our start to the season showed promotion wasn't a given, but to only lose one in 33 is incredible. And even though we've been flying, there's been no let up in the pressure, we've needed to keep winning to stay ahead. Next year will be tough, but at least we have some stability and positivity to build on. The bloke has done good work. The key thing is not to sack him if we finish mid table next season. Cannot say enough about the man. He has revitalised the entire club, assembled a hard working and hungry squad, brought the fans and club back together and we're moving forward. Best season in probably a decade and one of the special moments in 26 years following Rovers. Or are in the bottom half, 6 points outside the relegation zone, after 15 games. Still can’t get over last night. I’ve never felt such joy at a football game before. Sure I’ve been at Ewood for big wins and tight ones, even for UEFA cup nights but never before have I experienced *that* feeling. Euphoria. That’s all I can describe it as. Again it’s a shame those idiots ruined our chance to celebrate with the team by initially complying with requests to return to the stands and letting the team come out and then invading the pitch again. Morons. I even saw one goon trying to start a fight with a steward... after the biggest win for this club in years. Words fail me. Yeah I'm still annoyed about it Jim and the media team at the club and what's coming out on social media is obviously all positive but having been there in the stand to see the players come back out with champagne and banners to want to celebrate with all the fans only to basically run back down the tunnel aside from the few that got completely mobbed (Mulgrew, Lenihan, Conway, Dack, Bennett) is a bit of a shame. I can't make Charlton or Oxford where I suspect, certainly at Charlton on Saturday, regardless of the result the players and Mowbray will get to come and applaud and celebrate with what has been an amazing away support all season properly. You're right though, following Rovers you don't get many euphoric moments in the stands so it's special when they do come. I was 11 in 1995 and watched the final day on Sky and sadly missed the Worthington Cup Final but last night tops most of the odd special moments and goals I've witnessed in the stands. I guess that's a difference for me... In my time as a supporter, we've had the FMC win in 87, promotion via playoffs in 92, PL win in 95, promotion in 01 and the LC win in 02. In most other seasons we'd be putting a strong showing in the league even if we didn't end up with a trophy or promotion. And that only changed about 10 years ago when Hughes left. So whilst I'm delighted we've gone up, I'm not really feeling it as a special moment, it's more about righting a wrong.The Rovers I know shouldn't be playing at League 1 level. Oh completely, I was on holiday for the Worthington Cup Final and even prior to that for promotion in 2001 season back then before I was driving I'd only ever get to a few games a season when back up in the North West with family or games around holiday times. 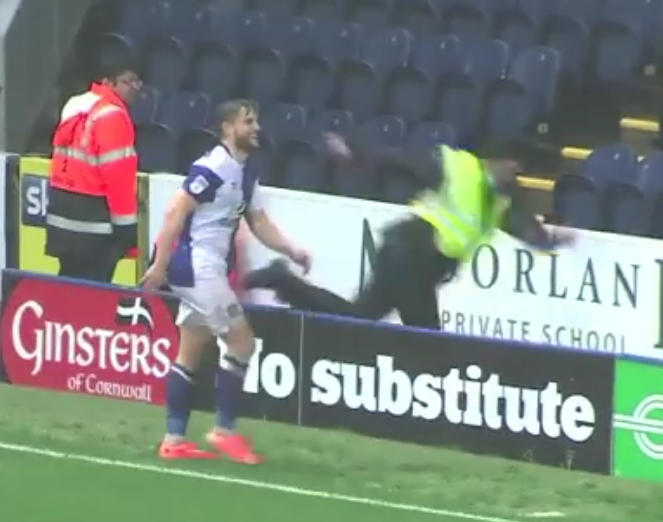 For me it's when that steward face-planted into the wall after Conway's goal playing Portsmouth this season. Never forget. I'll never forget being sat behind the goal when Pedersen missed an easy header right at the end of normal time in the FA Cup semi final vs Chelsea at Old Trafford.